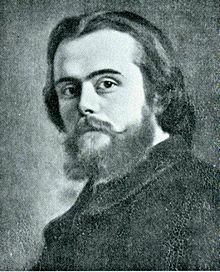 Marie-Esprit-Léon Walras (French: [valʁas]; 16 December 1834 – 5 January 1910) was a French mathematical economist and Georgist. He formulated the marginal theory of value (independently of William Stanley Jevons and Carl Menger) and pioneered the development of general equilibrium theory. Walras was the son of a French school administrator Auguste Walras. His father was not a professional economist, yet his economic thinking had a profound effect on his son. He found the value of goods by setting their scarcity relative to human wants. Walras enrolled in the École des Mines de Paris, but grew tired of engineering. He worked as a bank manager, journalist, romantic novelist and railway clerk before turning to economics. Walras received an appointment as the professor of political economy at the University of Lausanne. Walras also inherited his father's interest in social reform. Much like the Fabians, Walras called for the nationalization of land, believing that land's productivity would always increase and that rents from that land would be sufficient to support the nation without taxes. He also asserts that all other taxes (i.e. on goods, labor, capital) eventually realize effects exactly identical to a consumption tax,  so they can hurt the economy (unlike a land tax). Another of Walras's influences was Augustin Cournot, a former schoolmate of his father. Through Cournot, Walras came under the influence of French rationalism and was introduced to the use of mathematics in economics. As Professor of Political Economy at the University of Lausanne, Walras is credited with founding, under the direction of economist and sociologist Vilfredo Pareto, the Lausanne school of economics. Because most of Walras's publications were only available in French, many economists were unfamiliar with his work. This changed in 1954 with the publication of William Jaffé's English translation of Walras's Éléments d'économie politique pure. Walras's work was also too mathematically complex for many contemporary readers of his time. On the other hand, it has a great insight into the market process under idealized conditions so it has been far more read in the modern era. Although Walras came to be regarded as one of the three leaders of the marginalist revolution, he was not familiar with the two other leading figures of marginalism, William Stanley Jevons and Carl Menger, and developed his theories independently. Elements has Walras disagreeing with Jevons on the applicability, while the findings adopted by Carl Menger, he says, are completely in alignment with the ideas present in the book (even though expressed non-mathematically). In 1874 and 1877 Walras published Éléments d'économie politique pure (1899, 4th ed. ; 1926, éd. définitive), in English, Elements of Pure Economics (1954), trans. William Jaffé. That work that led him to be considered the father of the general equilibrium theory. The problem that Walras set out to solve was one presented by A. A. Cournot, that even though it could be demonstrated that prices would equate supply and demand to clear individual markets, it was unclear that an equilibrium existed for all markets simultaneously. Walras's law implies that the sum of the values of excess demands across all markets must equal zero, whether or not the economy is in a general equilibrium. This implies that if positive excess demand exists in one market, negative excess demand must exist in some other market. Thus, if all markets but one are in equilibrium, then that last market must also be in equilibrium. Walras constructed his basic theory of general equilibrium by beginning with simple equations and then increasing the complexity in the next equations. He began with a two-person bartering system, then moved on to the derivation of downward-sloping consumer demands. Next he moved on to exchanges involving multiple parties, and finally ended with credit and money. Walras wrote down four sets of equations—one representing the quantity of goods demanded, one relating the prices of goods to their costs of production, one for the quantities of inputs supplied, and one showing the quantities of inputs demanded. There are four sets of variables to solve for, namely, the price of each good, the quantity of each good sold, the price of each factor of production, and the quantity of each of those factor bought by businesses. To simplify matters, Walras added one further equation to his model, requiring that all the money received must be spent, one way or the other. But there are now more equations than unknowns. From the theory of equations, one learns that a necessary but insufficient condition for the existence of a unique solution to a system of equations is that the number of equations must equal the number of variables. Walras tackled this problem by selecting an arbitrary good, G1, whose price is designated as the standard against which the prices of the other goods shall be compared. The system of equations can now be solved for the prices of all goods in terms of G1, though not for the absolute price levels. The crucial step in the argument was Walras's law which states that any particular market must be in equilibrium, if all other markets in an economy are also in equilibrium. Walras's law hinges on the mathematical notion that excess market demands (or, inversely, excess market supplies) must sum to zero. This means that, in an economy with n markets, it is sufficient to solve n-1 simultaneous equations for market clearing. Taking one good as the numéraire in terms of which prices are specified, the economy has n-1 prices that can be determined by the equation, so an equilibrium should exist. Although Walras set out the framework for thinking about the existence of equilibrium clearly and precisely his attempt to demonstrate existence by counting the number of equations and variables was severely flawed: it is easy to see that not all pairs of equations in two variables have solutions. A more rigorous version of the argument was developed independently by Lionel McKenzie and the pair Kenneth Arrow and Gérard Debreu in the 1950s. A significant part of the general equilibrium theory as introduced by Walras has become known as the Walrasian auction which is a type of simultaneous auction where each agent calculates its demand for the good at every possible price and submits this to an auctioneer. The price is then set so that the total demand across all agents equals the total amount of the good. Thus, a Walrasian auction perfectly matches the supply and the demand. Walras suggests that equilibrium will be achieved through a process of tâtonnement (French for "trial and error"), a form of incremental hill climbing. I state that things are useful as soon as they may serve whatever usage, as soon as they match whatever need and allow its fulfillment. Thus, there is here no point to deal with 'nuances' by way of which one classes, in the language of everyday conversation, utility beside what is pleasant and between the necessary and the superfluous. Necessary, useful, pleasant and superfluous, all of this is, for us, more or less useful. There is here as well no need to take into account the morality or immorality of the need that the useful things matches and permits to fulfill. Whether a substance is searched for by a doctor to heal an ill person, or by a assassin to poison his family, this is an important question from other points of view, albeit totally indifferent from ours. The substance is useful, for us, in both cases, and may well be more useful in the second case than in the first one. In economic theories of value, the term "value" is unrelated to any notions of value used in ethics, they are homonyms. There is no general history of economic thought in English which devotes more than passing reference to his work. … This sort of empty fame in English-speaking countries is of course attributable in large part to Walras's use of his mother tongue, French, and his depressing array of mathematical formulas. Walras is … greatest of all economists. His system of economic equilibrium, uniting, as it does, the quality of 'revolutionary' creativeness with the quality of classic synthesis, is the only work by an economist that will stand comparison with the achievements of theoretical physics. Walras, Léon (1860). L'économie politique et la justiL'économie Politique Et La Justice: Examen Critique Et Réfutation Des Doctrines Économiques De P.j. Proudhon, Précédés D'un Introduction À L'étude De La Question Sociale (in French). Paris: Guillaumin. Retrieved 17 August 2018. Walras, Léon (1865). Les associations populaires de consommation, de production et de crédit (in French). Paris: Dentu. Retrieved 17 August 2018. Walras (1868). Recherche de l'idéal social: leçons publiques faites à Paris (in French). Paris: Guillaumin. Retrieved 17 August 2018. Walras, Léon (1874). Éléments D'économie Politique Pure, Ou, Théorie De La Richesse (in French). Lausanne: L. Corbaz. Retrieved 17 August 2018. Walras, Léon (1882). De la fixité de valeur de l'étalon monétaire (in French). Paris. Retrieved 17 August 2018. ^ Singh, H. K. Manmohan (1958). "Marie Esprit Léon Walras". Indian Economic Review. 4 (1): 6–17. JSTOR 29793129. ^ Walras, Léon (1969). Elements of Pure Economics; or, The Theory of Social Wealth. Translated by William Jaffé. New York: A. M. Kelly. p. 457,458. ^ "Marie-Ésprit Léon Walras, 1834–1910". The New School, The History of Economic Thought Website. Archived from the original on January 6, 2011. Retrieved 2010-12-30. ^ Walker, Donald A. (December 1981). "William Jaffé, Historian of Economic Thought, 1898–1980". The American Economic Review. 71 (5): 1012–19. JSTOR 1803482. ^ Walras, Léon (1969). Elements of Pure Economics; or, The Theory of Social Wealth. Translated by William Jaffé. New York: A. M. Kelly. p. 204. ^ Pressman, Steven. Fifty Major Economists. "Léon Walras (1834-1910)." 2nd ed., Routledge, 2006. ^ Stigler, George, 1994 , Production and Distribution Theories, New Brunswick, N.J.: Transaction Publishers, p. 222. ^ Léon Walras (2014). 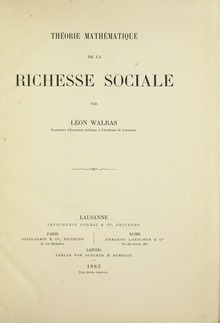 Léon Walras: Elements of Theoretical Economics: Or, The Theory of Social Wealth. Cambridge University Press. ISBN 9781316061725. OCLC 168491. Leon Walras (1834–1910). The Concise Encyclopedia of Economics. Library of Economics and Liberty (2nd ed.). Liberty Fund. 2008.